I distinctly remember the moment when I decided to give up. I had just typed the last words of a book labelled “that_sci_fi_thing.doc” on my computer. This was not the first book I’d ever written—in fact, it was the eleventh. I’d written my first novel a decade ago. I’d thought it was brilliant, but the hundred or so agents I’d sent it to disagreed with me. Undaunted, I told myself that first books never sell, so I wrote another one. A better one. I sent it out to about a hundred more agents, and not a single one thought I had improved. I did this ten times over ten years, and trunked each one of those ten novels after close to a total of a thousand rejections. Hear “no” a thousand times, and you start to get a little down on yourself. Because “no” didn’t just mean the agent was rejecting my work. It meant my work wasn’t good enough. And deep down, I thought it meant that I wasn’t good enough. The worst rejections were for the tenth book. It was a fantasy, and I wrote it to the market. I carefully analyzed all the top sellers at the time, picking out the most popular tropes, and wrote a story that fit those tropes. It had not heart, but by God I thought it would sell. So when I typed the last words of that little sci-fi book, I decided to give up. Because if the book that I’d written to fit the market didn’t get me an agent, how could this book that was strange and weird and definitely not on trend find a home? There wasn’t any science fiction set in space for teen readers on the market at that time. Dystopians were gearing up, but my book wasn’t exactly a dystopian. And I had a thousand voices in my head telling me I had already failed. But what did I have to lose, other than the last remains of my hope? I sent my queries out. And I got several “nos.” One agent told me flat-out that “space sci-fi doesn’t sell” in the YA market. One said that she would consider it if I rewrote it for the adult market. A couple told me that they’d tried to sell sci-fi to YA editors, but it was a nonstarter. But an agent offered. In fact, five agents offered, and now the girl who had a thousand “nos” had five “yeses.” I chose my agent—my dream agent, the one who represented my favorite author since girlhood—and happily signed her contract. And then I got another “yes,” from my dream publisher. It would be a happy little story for me to stop here. To ride off in the sunset and tell you that Across the Universe was the result of “that_sci_fi_thing.doc,” that it debuted on The New York Times Best Sellers list, that it led me to fulfilling my lifelong dream of becoming an author. Because that’s all true—my dreams quite literally came true with that book. Since Across the Universe, I’ve published four more novels with major publishers (including one with Star Wars!) and self-published a novel and four nonfiction books on writing (including my recently released Paper Hearts Workbook, which I designed specifically to help aspiring writers complete and submit their novels). I have two novels coming out this year—my first fantasy and my first adult novel. But I’ve also had rejections. There was a book proposal I worked on for months that was summarily rejected by publishers. There was the full-length novel and two outlined sequels I pitched to my agent, but which weren’t good enough. There was the picture book idea I adored but could never quite perfect. And while my novels have gathered their fair share of five-stars, they’ve also gotten one-stars, some of them quite nasty. I’ve organized signings where no one showed up except the bookstore cat (which, to be fair, at least there was a cat). I’ve sat at tables at book festivals where the author beside me had a three-hour line and I had three sales the whole day. And honestly? It was all the “nos” from before I got the “yeses” that helped me survive the new disappointments. I’ve had zero problem rewriting novels from scratch because I never took edits personally. I was able to shoulder past negative reviews with hardly a blink. I learned how laugh at the inevitable bad events. And I learned to write better. Because every time I hear “no,” I know that I haven’t given it my best. I know that I can give it one more try. We need rejection. It teaches us to push harder, to truly do and try our best, to put it all out there and try even when failure seems certain. It teaches us how to survive. Regardless of the “nos” you may collect as you venture forth in writing and publishing, don’t forget the “yeses” that cancel them out. Let the rejection be the strong foundation upon which you build your dreams. ​ Beth Revis is a NY Times bestselling author with books available in more than 20 languages. Her latest title, Star Wars: Rebel Rising, tells the story of Jyn Erso’s past from the movie Rogue One. Prior to that she wrote A World Without You, a semi-autobiographical story blending the supernatural with mental illness. 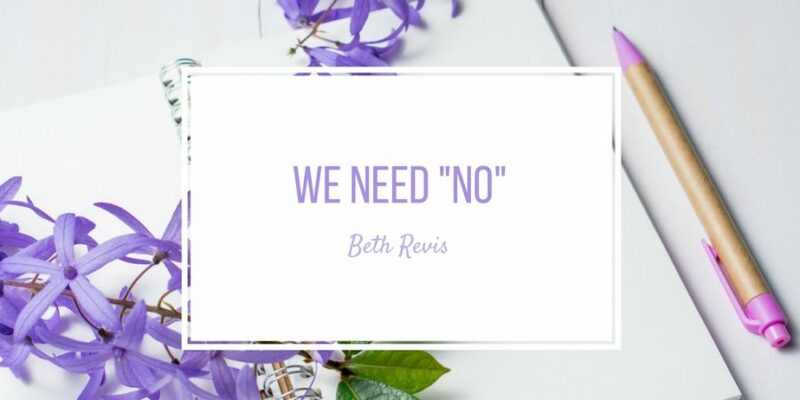 Beth is also the author of the Across the Universe series, The Body Electric, numerous short stories, and the nonfiction Paper Hearts series, which aids aspiring writers. She will have two additional titles available in 2018. A native of North Carolina, Beth is currently working on a new novel for teens. She lives in rural NC with her boys: one husband, one son, and two massive dogs. This was so good to read, inspiring and hopeful. I’m on my seventh manuscript. Agents’ responses suggest I’ve improved since the first, just not enough yet. I’ve got hundreds of ‘nos’ under my belt and I’m still hoping for that ‘yes’ but I’m getting a little worse for wear. Such an encouraging post! I’m glad you finally got your “yeses.” A World Without You is one of my favorite contemporary YA novels. Thanks for writing and for taking part in WriteOnCon! Great post–thank you for this! Thank you for this inspiring post! One of the things that keeps me writing is that there is always more to learn. That last line is getting printed off and posted above my writing desk. Thank you for such an inspirational post. I thoroughly enjoyed reading it. This was so inspiring and encouraging. Thanks for posting!